A local government process for floodplain management designed to supplement existing practices or serve as a stand alone product from ordinance to project completion. 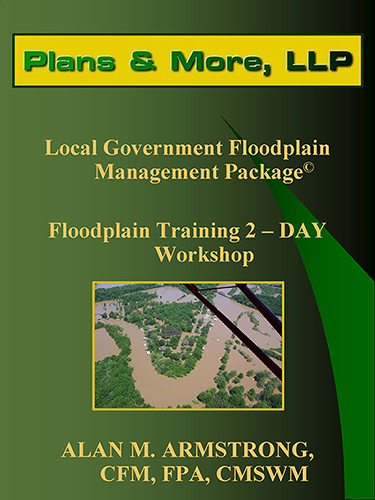 The complete Plans & More, LLP Floodplain Management Package© includes a floodplain ordinance, standard operating procedures (SOP), development checklists, applications, and permits, SFHA development tracking database and reports, training module, reference guide, and floodplain mapping SOP. We offer three (3) service options (A, B, & C) designed to fit the needs of your local government. View Our Service Options. This innovative process for Floodplain Management was implemented in several communities in Tennessee. Letter of Recommendation for Floodplain Management Package, Floodplain Management Consulting Services, and Training. Plans & More, LLP is offers local government consulting services in response to presidential declarations of flooding. We recently worked with four local governments to facilitate damage assessment team training, data entry, and permitting advice for rebuilding using the FEMA Substantial Damage Estimator (SDE) process. After the Middle TN Flood of 2010, we provided management and recovery consulting services to Kingston Springs, TN. Our firm directed the Damage Assessment, Rebuilding Permit Operations, File Documentation, City Commission, Planning Commission, and Board of Zoning Appeals operations for the City. Our firm was invited to present this project at the USACE Silver Jackets Workshop, 18 August 2011, in Nashville, TN. Please contact Alan M. (Mike) Armstrong, FPA, CFM at (615) 426-8556 or razorback1@plansandmorellp.com to discuss the needs for your community. Our firm assists Local Communities with the update process for FIRM Map Changes. Currently we are assisting Kingston Springs, TN with Floodplain Management Program Ordinance and File updates, community and Local Government Training on regulatory changes to the NFIP and EO 11988 & 13690..